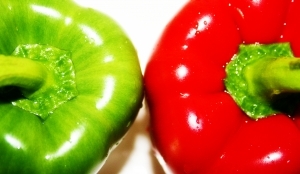 Live For Food » Blog Archive » Is healthy eating normal behaviour? When you are making food choices its interesting to review the way other people make theirs. I love watching what other people put in their trolleys at the supermarket, and what the person in front of me at a cafe chooses. I work in an office with at the most four other people around me on a regular basis. There is me who tries to make healthy food choices, and has a mini internal battle to justify a biscuit or piece of cake. There is another lady who is slim and can eat whatever she wants. Then there are three men – one sometimes attempts a healthy choice and the other two generally eat what they fancy when they fancy it. One of the men the other day was trying to decide between a pasty and a sandwich for lunch. I suggested he have a salad for a change and you would have thought I’d suggested eating eyeballs from the aghast reply! The other day I went out to a clients where the lunch options were described to me as: a sandwich shop, MacDonalds, KFC, the Chinese, or the chippy. In my head, only one of these options is an acceptable lunch option – the sandwich shop – but that implied to me that most other people in that workplace frequent the other options. The staff however are mainly male, and a lot are warehouse men or lorry drivers. However often at clients the female admin staff will be bringing in their own salads and sandwiches and fruit. I definitely get the impression its easier from a social point of view to be healthy eater if you’re female. People assume that ladies watch their weight and envy each others willpower for bringing in a salad. The men go out for a pie or a pasty or an enormous sandwich on white bread, and get called wussy if they choose “rabbit food” or fruit. However from a physical point of view the men can get away with it. A 6 foot man can eat a MacDonalds within his calorie intake but it will probably put a 5 foot lady over her limit. What it does to their respective insides is another question. Men also seem less likely to snack, and more likely to wait until they get hungry and then grab something to eat – whatever is closest or easiest. Women are more likely to plan their meals and are a lot more likely to tie in their emotions both their food, either through emotional eating or by assigning good and bad characteristics to food. Healthy food doesn’t seem by anyone to be viewed as normal behaviour. Women see it as a lofty aim or a feat of willpower rather than a natural choice, and men see it as something that makes them less of a man and more of a rabbit! Whose fault it this? Our fault? The government? The food industry? Why do the government have to persuade us to eat 5 fruit and veg a day? Isn’t it obvious that they are good for our bodies? Are the food industry intent on addicting us to processed food with high sugar and salt contents so we buy more and more? Can people really be unaware of the dangers of eating too much, and too much of the wrong thing? The answers may be linked to any or all of the above but nothing is going to change overnight. The only thing we have a certainty of changing is ourselves. If we change ourselves we may even change others! My boss kindly took me to the sandwich shop that day because he knows I prefer a healthier choice. And so he had a sandwich too although I’m guessing he may have fancied a MaccyD. The day after we all had fish and chips which the client kindly bought us, and I had a salad in the evening. Is healthy eating natural for you and those around you? Or are you fighting a lone battle? Interesting how we could be influenced by other people’s choices. Even here in the skinny SF Bay, eating healthy is kinda weird. Salad ok, vegetarian okay, but brown rice or beans and no dessert is kinda weird. It may be a little different for me, as 50% of my company is Asian and they think sandwiches and bread and cheese are weird, and I get the impression that they’ve never known an American to cook or prepare food. And looking around, they’re probably right (including the Asian-Americans who were born and raised here, who also don’t cook). None of the others at my workplace make lunch and bring it from home – they tend to buy something from the shops on the day – which is generally less healthy and more expensive! In my husband’s workplace healthy eating is not the norm. In fact people are often curious about the food he brings home from work! I think we are making this much too complicated: as long as you aren’t developing deficiencies, you are eating “healthy”. The idea about food being “unhealthy” is much closer related to carrying too many calories. In other words. most people aren’t eat unhealthy, they are just eating too much. Granted, vegetables and fruits make that more unlikely, but I think most people would be better off if they just realized how many calories they are consuming. It’s definitely easy to overeat these days as food is so readily available and portion sizes so huge when you eat out! I agree that people often don’t have much concept of how many calories they consume.